Featuring: Paul Newman, Michael Ontkean. Director: George Roy Hill. Warning: This movie will only stream until April 30th so act fast! There aren't many great actors that can do both comedies and dramas. Comedic and dramatic timing just seem to be on different wavelengths. Paul Newman, however, can pull it off. He's always had a sort of mischievous look to him and provided a sense of humor to most of the roles he's played. Plus, it's friggin Paul Newman, he can do whatever he wants. 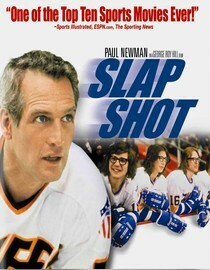 Slap Shot is a raunchy sports comedy about an awful minor league hockey team that is going to fold unless they turn their season around. Really cliched, right? Yea, it's your average underdog sports movie plot, except that they don't start winning because of hard work and stick-to-it-iveness. They start winning because they decide to just start beating the crap out of the other team. If you're looking for a foul-mouthed sports movie filled with guy humor this is your best bet. This movie wrote the blueprint for movies like Major League and holds up really well. This is still a very funny movie, the only thing dated is all the polyester. According to Netflix this movie will stop streaming on 4/30/11. Of course, sometimes they lie. Why is it in your queue? Paul Newman. Is it artsy? Not in the least. What stood out the most to you? The Hansons. No, not the band. What mood should I be in to watch this movie? Looking for crude humor that is very well done. An Ivanlandia fave, and one we remember seeing in the theater (at age 12, with some other kids, for, of all things, a birthday party! It was awesome!). This would have been an awesome movie to watch for a bunch of 12 year old boys. Even if the content might not be entirely proper.